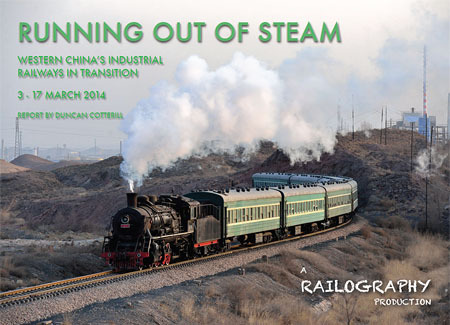 This illustrated report covers a two week trip to the Baiyin and Tiehejinchang lines in China's western province of Gansu from 3 to 17 March 2014. Both lines visited use a mixture of steam and diesel traction and, with steam in rapid decline, things didn't turn out exactly as anticipated. The main illustrated report is in pdf format. Click on the cover image (right) or the link below to view or download it. Warning 6.5MB file. For those with a slower connection, a text only version is also available here as a normal HTML webpage. Note: if this report doesn't open as expected in your browser, try right clicking the link and using the option to save or download the file instead.